Ring Power is a privately held, heavy equipment distributor headquartered in St. Augustine, Florida. Established in 1961, Ring Power has built a quality reputation as an equipment supplier with one of the industry’s largest product line-ups, all backed by best-in-class parts and service support. 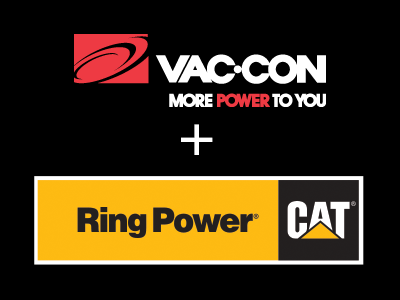 As a CU dealer, Ring Power Utility Equipment Division will provide contractor end-users with the rental and sales of the Vac•Con hydro-excavation product line for primary use in the construction industry. low flow water jet system with a high-performance vacuum. Since 1986, Vac•Con® has manufactured more than 8,000 custom-built, truck-mounted machines to serve public and private environmental markets worldwide. Our goal is to design and actualize the most powerful and reliable machines in the industry, taking care of our customers’ needs now. Our global dealer network assists us in reaching all corners of the world, ensuring More Power To You. For more information, visit www.vac-con.com. Vac•Con is a trade name of Holden Industries, INC.